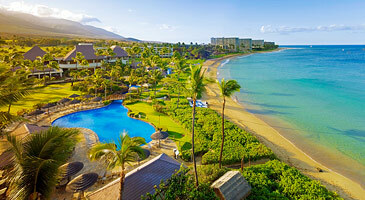 Set at the foot of legendary Black Rock, the resort overlooks the pristine Ka`anapali Beach and the blue Pacific. Surrounded by 23 acres of lush gardens and lava rock waterways, it welcomes families to an enchanting world of comfort, luxury and adventure. Starwood Preferred Guest Members: Please note that Starpoints® are not awarded for air-inclusive vacation packages. However, Starpoints® are awarded for select in-house charges posted to your room account during your stay. Valid on new bookings only. Rates, terms, conditions and itinerary are subject to availability. Where applicable, kids stay free in same room as adults using existing bedding. Occupancy limits apply. Starwood Preferred Guest Members: Please note that Starpoints® are not awarded air-inclusive vacation packages. However, Starpoints® are awarded for select in-house charges such as dining, activity and spa purchases posted to your room account during your stay. Offer subject to change without notice. Not responsible for errors or omissions. [Pleasant Holidays acts only as an agent for the various travel providers shown above.] CST#1007939-10. UBI# 601 915 263. TAR#5308.